The U.S. Bureau of Labor Statistics (BLS) released the Consumer Price Index (CPI-U) data today for the month of January. The verdict was that inflation had fallen rapidly from 0.76% in December to a slightly deflationary -0.09% for the 12 months ending in January. This is the first time since 2009 that we have seen Annual deflation although there were several times during 2014 that we saw monthly deflation. Monthly deflation (annual disinflation) means that prices are slightly lower than they were last month but still higher than a year ago, which typically happens a few times every year (generally in the 4th quarter), but this year prices began falling during the summer, indicating growing deflationary forces due to FED tapering (i.e. not inflating as much). But now we have annual deflation (prices lower than a year ago). But this annual deflation is not the same nature as that of 2009 since that resulted from an implosion of the money supply (stock and housing market) while the current deflation is the result of lower energy prices. Most people will benefit from the current situation while most suffered in 2009. The one caveat of the current situation is that most of the job creation since 2009 has come from the energy sector and sustained lower prices could result in a loss of the primary driver for the current economy. Overall energy on a “seasonally adjusted” basis was down -9.7% for the month and -8.2% on an unadjusted basis for the entire year. Fuel oil fell -9.9% for the month (adjusted) and a whopping -29.7% annually. Gasoline was down -18.7% monthly and -35.4% annually. On an annual basis electricity rose 2.5% and Natural gas fell -0.4%. If we compare January 2014’s cpi index which was 233.916 with January 2015 (233.707) we can see a -0.209 point decrease in the 12 month period. -0.209 / 233.916= -0.09%. Historically speaking, on an annual basis inflation is very low. 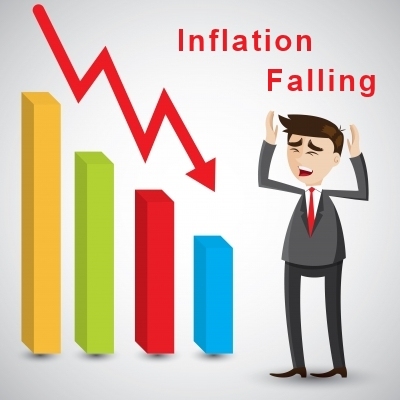 Deflation only rarely occurs on an annual basis although it is more frequent on a monthly basis. The last time we had deflation on an annual basis was in 2009 but prior to that it was 1954 and 1955. Current Annual Inflation Rate starting in January 1990. Connect with Tim on Google+.